See more Expansion detail and LOTS of pictures on this page. Expansion Project. 01/12/2019 - Announcing our numbers for 2018. This was our best year ever!!! Rescues - 122 - including 26 seniors over 9 years. 11/24/2018 - Hoping every one had a great Thanksgiving weekend. We had am amazing house full of family. Great food, great visiting with so much to be thankful for. We have made huge changes here over the past year. We still have a ways to go before we can call it complete, but we have come so far it is really quite exciting. We are very excited for the end of the year when we announce our annual numbers as we have already exceeded our goals in placements and special needs. We are thankful for our DPR family for being so supportive and opening their hearts and homes to these little guys who have so much love to give. I love what is happening with our Facebook group. Our DPR family are finding each other and making wonderful connectons. Lots of knowledge out there if you are having training issues or other questions. If you have one of our fukids check it out -or- even if you don't - lots of fun and conversations. Be sure to check out our Available page and get your application in.. Things happen quickly around here, so if you see a furbaby you love don't delay in applying. 11/11/2018 - As we get into the holiday season and winter weather we are working very hard to make sure we have everything possible done to make outside play as comfortable as possible. We have all the run ground covered and have just ordered a couple of party heaters to help take the edge off on the coldest of mornings. Inside we will be finishing up the last two windows next weekend. We are very excited that we have placed all but four of the 24 surrender. All are doing great in their new homes. We have some amazing CA kids here right now. Sugar Momma and the Sweat Treat puppies are doing great and we already have a couple of applications on the puppies. Things happen quickly around here, so if you see a furbaby you love don't delay in applying. 07/31/2018 - We have a very active month planned. On the 18th we will be bringing in 20 dogs from a surrender. We will welcome volunteers with this surrender beginning the 19th as we work through teeth, baths, evaluations and vet prep. This will be an active time. Along the lines of getting ready for this big intake we have escalated some of the work we are doing. Today (07/31) we had the first truck load of gravel delivered for the ground prep on the new South runs. I have a super hard working "rent-a-kid" helping me today. Friday morning brings the first load of top soil and Monday the next. Help in leveling and pulling out the old runs is welcome this weekend. We have fence to pull, pavers to move, ground to level. and more. This weekend will be a biggie as we are also working inside to try to get the new grooming area complete. That work includes completion of the drywall and flooring, laminating the counter and connecting the plumbing. With just two weekends before this intake we are working hard to complete these things so that it will be a much easier to manage the event. Funds are needed for the gravel and dirt. We will end up with right at $1000 in for all of that. Additional funds for the Vet care of the dogs we intake. We are estimating an average of $100 per dog. Some won't need much but others are going to need a lot. 01/07/2018 - We are thrilled with our numbers for this year. This year we welcomed our nice Tina, and her 20 yr son into our home and have them fully indoctrinated into our version of crazy. Six of the special needs were major medical cases. 05/02/2017 - We are currently hosting a very special little guy. 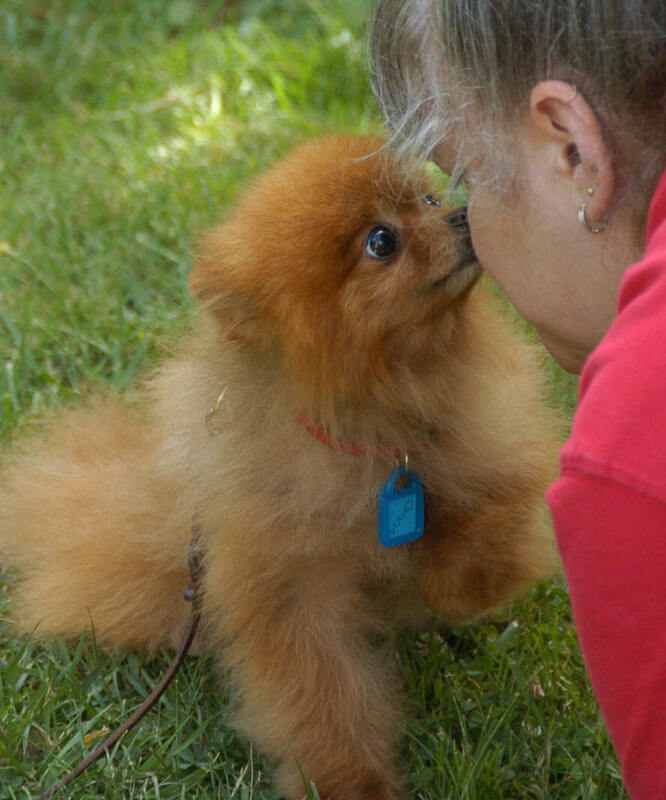 Bizzie Bee is an adorable Pom with some special needs. He arrived with us extremely overweight and unable to walk. We have been working on his weight and therapy to hopefully get him walking again. Watch for updates below on his progress. We will be updating with pictures and video as we go. 01/14/2017 - Here are our stats for 2016. We are quite pleased with our numbers, especially considering the big special needs expenses we have taken on and all the work with the construction. 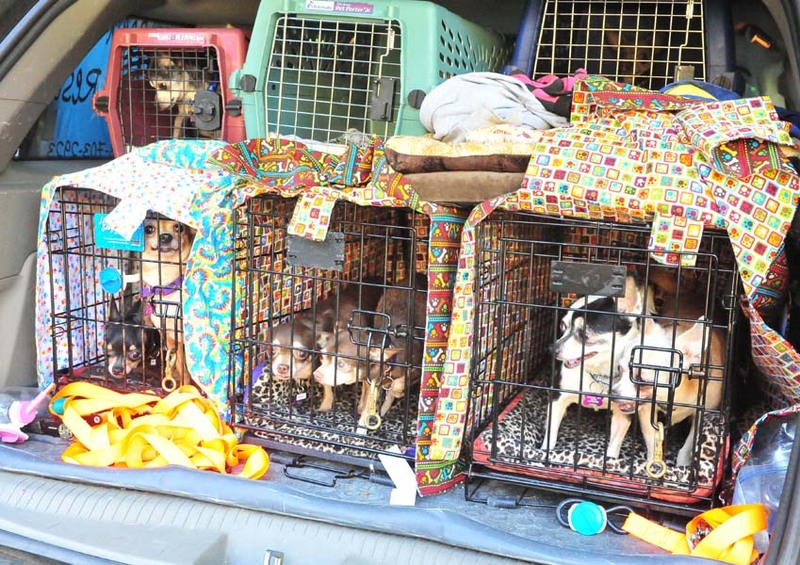 Of these rescues 20 were from Oregon Shelters 30 from California Shelters. Five of the special needs were major medical cases. 10/07/2016 - What an amazing month. Stacy Lou Who's surgery went famously. Her heart has been successfully repaired with no future issues anticipated. We have completed integrating our 19 incomings of a couple weeks ago and have completed all of their vetting. We have been working hard on the expansion and nearly have all the plywood and tarpaper up. With the sun this weekend we are hoping to have that bit done. We will be ordering the metal first of the week. Fund raising wise, we have two on-going fundraisers the Expansion and the Special Needs/Senior (posted with Alfie's detail.) Thank you so much to every all of our donators. Without your help we couldn't be doing the big things we are doing now. As of today the Expansion is the place we need help the most. Please continue sharing and donating. Even a small amount, the price of a cup of coffee, makes a difference to the dogs here. 06/27/2016 - The construction continues. Funds are definitely needed here. Right now the lumber is our heavy hitter. We were able to find windows from Habitat for Humanity so saved lots there. All the windows and doors ran $100 rather than the $700 we were expecting for just the windows. See more detail on this page Expansion Project. 05/01/2016 - We are moving right along with out Expansion. We have the leveling done and the gravel in and hope to be moving the structure into place this weekend. Right now our biggest block is funds. Getting the gravel and dirt we needed completely tapped our reserves so any and all assistance is very much appreciated. Only with your help can we make this a success. We have a fund raiser created to cover 7K that will get us going with this new room ready for the fur kids. Only with your help can we make this a success. 03/28/2016 - Very exciting news!!! We have a very solid lead on a job trailer that we will attach to our home and remodel into our rescue room. This is a project that is a long time in coming and we are just giddy about getting rolling on it. The intention of this expansion is to allow us to greatly increase what we are doing. We hope to have the unit here later this week and can get started on our destruction - in order to move into construction. SO - I have created a new fund raiser to cover 7K that will get us going with this new room ready for the fur kids. Only with your help can we make this a success. 03/26/2016 - We are working through some social media challenges when the folks at FB decided it was time to convert our account to a fan page. All of our friends came in as likes, which will not show them all of our posts. We have created a group and would love to see all of our friends join this group. Given this back step we have lost contact with many of our regular donators. I am working to send out notices via email, but in the meantime help in sharing our group, inviting your friends to join is greatly needed. 03/04/2016 - Sunny is our newest special needs recipient. Of course his coming so soon after Coco means that I took a huge leap of faith that funding will be here when we need it. His first vet visit was today. He has an eye injury that is going to require treatment by a specialist. They have told me that just the office visit is $100 - we don't know yet what the extent of the damage is, but I suspect he is going to require surgery and we have yet to see if we can save his eye. We received medications and did blood work today with our regular vet, which was $150. Sunny's appointment is scheduled for the 29th, and they have me on the cancellation list hoping to get him earlier. Sunny is not in pain with this condition and we are taking care to ensure that he is not rubbing or causing other issues. We also have a backup plan in case things get worse. 01/08/2015 - 2015 Statistics are in and we had an amazing year!!! Without the assistance of our generous supporters we couldn't do any of this. Donations are in great need and can be sent by several methods. We are a 501c3 organization so your donation is tax deductible. We will also be kicking off a YouCaring fundraiser in the next few days for our Senior/Special Needs fund for 2016. In 2015 we had $3300 paid out for just the Vet care of our Seniors and Special Needs kids. 12/17/2015 - Happy Holidays to everyone. We are still working applications, setting appointments, and working through the application process. We will not be brining in any new kids until after the first of the year. Time for a little break with our family. 12/10/2015 - We are getting quite excited about our Saturday the 12th PetSmart event and have some wonderful cuties to share again. We are only going to be there the one day from 11-3 so make sure to stop by. This month we are celebrating our 100th 2015 rescue in Princess!!! and as I type we now at 104 for this year. Very exciting to see the impact we can have with our little program. 11/18/2015 - I can hardly believe that it is almost Thanksgiving. With the holiday season here gift buying is on everyone's mind. I have received a couple of calls this week and feel inclined to remind everyone that a surprise puppy for Christmas is not an appropriate gift. The person receiving the pet needs to be involved in these decisions, making the match and the commitment to love and care for the pet for the rest of their lives. Of course there are instances when parents bring home a pet for their children and the parents are making the commitment to make the pet a family member. One call I had this week was a young lady wanting to surprise her sister. Another call was a son wanting the surprise gift for his mother. Where I appreciated the care and thought involved, we do need to work with the adopter to ensure that the match is the right one, and not just the gift giver. 10/06/2015 - This year is flying past. Because of a recent incident I want to remind everyone who has one of our dogs. Please, if you are unable to keep the dog get it back to me. Because someone did not do this, they gave June to someone they knew. 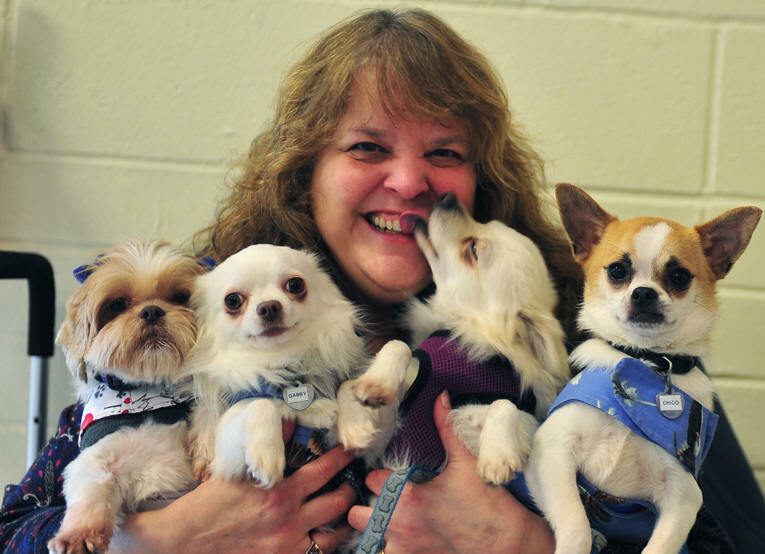 Then when they had a falling out poor June (a tiny Chihuahua) ended up in the shelter again. Because I keep all of our microchips registered to us I was contacted and able to recover her. This shelter is great and we work with them all the time. June is here safe and looking for a new home. I can't describe how upset I was about the situation. 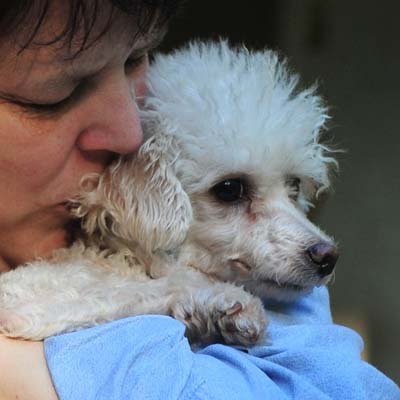 It would have been a simple thing for them to call me when they needed to place her, rather June has once again been through the traumas in a shelter. So please let me know if things change at your home. If you have someone who wants to adopt let me go through our process with them. Even a family member needs to understand our process and agree to our terms. 08/19/2015 - Things are crazy around here. We just took in 6 Maltese and a Lhasa. They are getting their vet care tomorrow so you will see pictures being posted soon. Trouble's recovery is going great. He is using the foot most of the time and is ready for his new home at any time now. King is doing great as well. I know that the right home is out there for these special needs guys. 06/28/2015 - Heat relief tip for dogs. Wet a beach towel and put it in the freezer. Our dogs love them. They lay sprawled on them for hours sleeping comfortably, cooling their undersides will cool their bodies. Also, put some ice cubes in the water dish. The love to play with them and chewing on them will cool their system. Remember - shaving your coated dog does not make them cooler. It actually is removing their insulation and allowing more heat to penetrate to their body. If you have a shaved dog make sure to keep them out of the heat as they can get heat stroke very easily. If you have a dog that has gotten over heated, wet them with cool water and give them a cold wet towel to lay on. Make sure to give them plenty of water. Clear Pedialite is great for dogs too. It contains electrolytes that will help them deal with the stress of the heat, just like our Gatoraid helps us. 04/06/2015 - I am trying something new here. We have tried all kinds of air filters without much luck. The ones I have worked with all end up filled with dog hair and dirt, expensive for filters and simply don't work or don't last. Last weekend I brought home a new Triad Aer http://www.triadaer.com purifier and just over a week I am seeing huge changes. The first thing I noticed was that the dust motes that hang in the air are gone. The air seems clear and cooler. I have also been having fewer issues with my asthma and Wickett my seasonal allergy dog is having fewer issues. It is tough for me to determine if there is change in any odors, but I have someone who comes in the mornings to help me and she says, even though we didn't have bad odors, she smells an improvement with this new filter. I have created a page where I will be posting updates we see changes in our environment. I will also include questions and comments from others - good or bad. I am way curious about the experiences of others. 04/02/2015 - Happy April everyone. Spring is here and we are still driving hard to get started on our Expansion Project. We are a long ways from having the funds to get going. Every single dollar is going to help us along the way. You will find several means of donating listed here and you can always email me for other ways. 03/01/2015 - Two wonderful boys looking for a home together. Shadow and Bear will make great family dog. They are pretty shy, Bear especially. Looking for the perfect home that will love these guys for their entire lives. 02/14/2015 - What an amazing Valentines day. The PetSmart event was a blast and all the dogs had so much fun. I believe (we will know soon) that we have two placements. Nothing could be better than a lap full of puppy love for Valentines. 01/04/2015 - We are very excited about the start of this year. Having placed all but one of our 2014 rescues it makes for a very positive start. 2014 hit us a little hard with our son's near fatal accident in September. He is doing well and we expect a complete recovery. He is even looking forward to getting back to work soon. Even with all of our family needs the rescue numbers are significant. We are thrilled to continue our works. Check out our Go Fund Me opportunities. You can email me for donation options, or donate through paypal friends and family to christy@displacedpetsrescue.com. You can donate directly to our Vet, the Companion Pet Clinic in Scappoose, OR - or - Companion Pet Clinic in Forest Grove, if you like. We work with both of these vets on a regular basis. If you do donate directly to the Vet please advise me, at the above email, so that I can ensure we get the appropriate credit. You can also mail a donation to Displaced Pets Rescue, 54582 Nehalem Hwy S, Vernonia, OR 97064. 12/292014 - With only a couple more days to the new year we so very excited that we have found home for all but one of our available dogs. Not to worry though. We are expecting some new furkids later this week. As always our ability to do the work you do depends on the donations that we receive. No amount is to small. Get your donation in before the first and take advantage of the tax deduction on your 2014 taxes. 11/20/2014 - I had an encounter with a young visitor today that touched my heart so profoundly that I felt inclined to share it. As Justin sat playing with the furkids his momma told him "Remember we are just playing with the puppies. We can't have one where we live, but we can come out to play here again." Justin answered, "That's ok Mommy, I understand that." After thinking for a minute he said "Mommy, remember when you asked me what I wanted for Christmas?" At this point I could see the pain cross his mothers face, thinking "oh my, he is going to ask for a puppy". "Yes," she cautiously answered. Justin continued, "Could I just come and play with the puppies for Christmas? You don't have to get me any Christmas Presents you can give the money to the puppies so that more can get saved. I just want to come and play with them." OK... Momma and I both cried. Through the tears Momma replied, "You Bet! We can certainly come and play with the puppies for Christmas, and I am sure that Santa will find something wonderful to put under the tree as well." What a wonderful family and heart. If every one who read this would donate just a little bit to help out the puppies, Oh My, what great things we could accomplish. 11/07/2014 - Thank you to everyone who expressed their well wishes to our family. Neil is doing well. He is home now an working very hard on his physical therapy. He still has a long haul ahead of him, but things are getting better every day. Things are rolling along here again. Being gone for two months has definitely left a lot of things to catch up. Funds are super tight, especially with winter weather sneaking in on us. The current task is winterizing the runs so we don't end up with muddy dogs LOL. We have several wonderful furkids who are looking for their forever homes, see more detail on them the Available page. 10/01/2014 - Some of you have seen on our Face Book pages what we have been going through in our personal lives. Our oldest son was in a an accident on 09/01 and I have been away helping with his care. I have an amazing friend who is helping us get through the placement process with the dogs currently under our care so placements are happening, just be patient with us please. I will not be doing much intake until I am back at home, likely near the end of October. 08/06/2014 - It has been a bit since I have made an update here. We have been very busy with rescues and events. Our feature dog this month is LuChia. 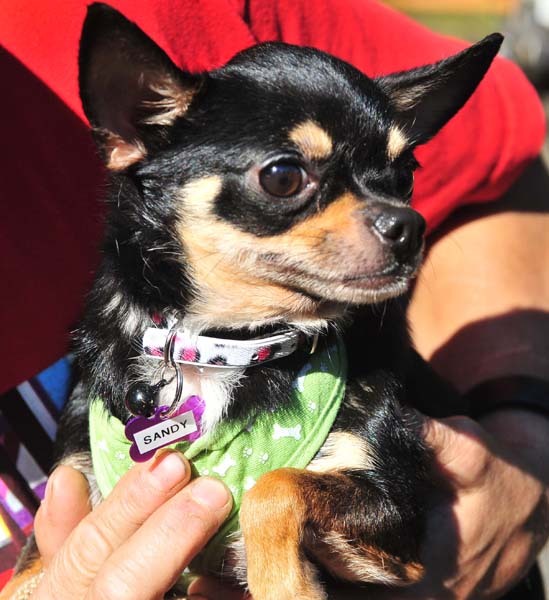 She is a super sweet Chihuahua girl who will love spending time in just the right lap. We are once again on a disparate quest for funds. We received a lovely family of Papillion mix dogs in and all are ill with pneumonia. They are on the mend, but have left us short of funds. Any assistance would be greatly appreciated. I will be posting pictures and listing as available after they are feeling better. 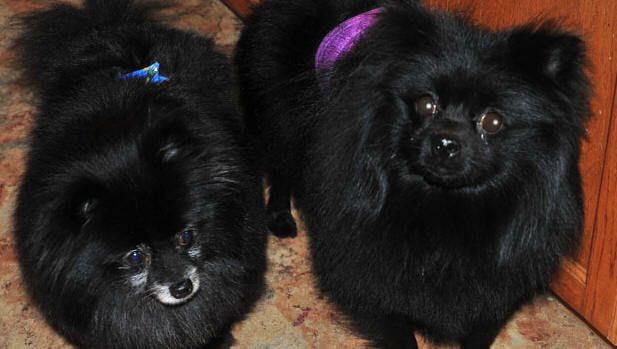 3/17/2014 - Thank you to all of those who helped, personally and financially, with our Pom rescue. We didn't cover all of our expenses, but were only about $300 short. We have a new case that just came in to us on Friday. Chestnut is a super sweet Pomeranian/Pekinese mix. She has at least two hernias that need to be repaired and we are seeking funds to help with that extensive surgery. You can email me for donation options, or donate through paypal friends and family to christy@displacedpetsrescue.com. You can also donate directly to our Vet, the Companion Pet Clinic in Scappoose, OR. If you do donate directly to the Vet please advise me, at the above email, so that I can ensure we get the appropriate credit. 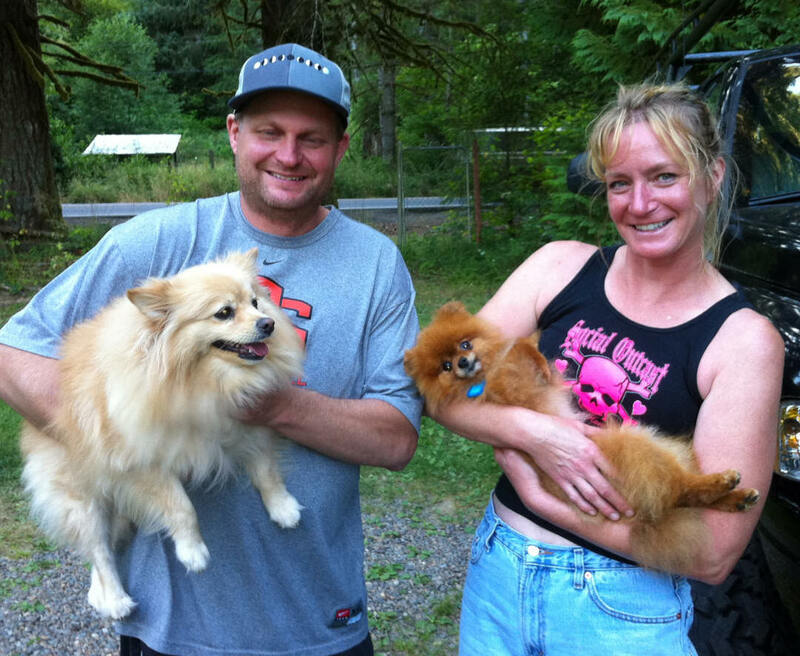 01/30/2014 - We have the 10 Poms that arrived yesterday from a Southern Oregon Shelter and Breeder Surrender. We are in desperate need of funds to get through the vetting for these guys and are expecting an average of $300 for each and don't expect our placement donations to cover the expense. You can donate through paypal friends and family to christy@displacedpetsrescue.com. You can also donate directly to our Vet, the Companion Pet Clinic in Scappoose, OR. If you do donate directly to the Vet please advise me, at the above email, so that I can ensure we get the appropriate credit. 01/10/2014 - Welcome to 2014 - If you are anything like me I am still struggling with writing the year correctly. I am thrilled to announce our numbers for the 2013 year. We are trilled with all of our accomplishments. 12/20/2013 - We are very excited to be spending the holiday with our family this Christmas. Our holiday also includes a couple of birthdays and an anniversary :). During our vacation I will be processing applications, answering emails and scheduling visits for after the 1st. Feel free to complete your application and rest assured that they will not get lost in the holiday. Wishing Everyone the very best of Christmas Holidays!!!! 11/27/2013 - Wishing everyone the best of Thanksgiving memories. Take time to enjoy all of your year's wonderful memories. 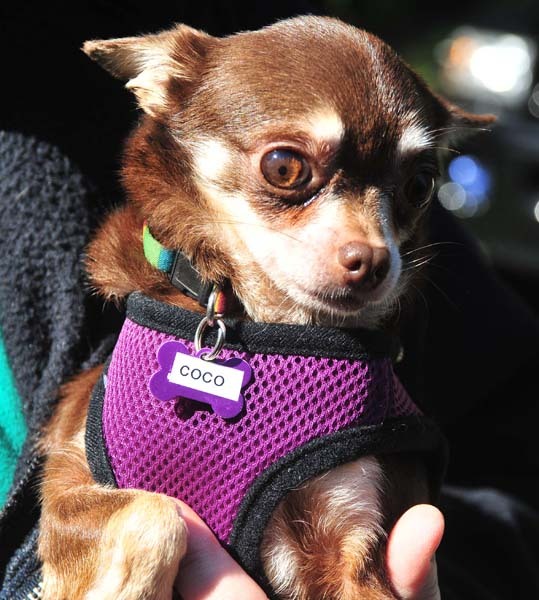 We are thankful in that we have rescued 98 dogs so far this year. We are thankful that we have placed 91 dogs so far this year. This is a record for us that we are incredibly proud of. Our Christmas wish is to have all of our little wards in their forever homes in time for Christmas. We have so many that will be wonderful loving family members. With the number of rescues we have had some losses this year as well. We are thankfully remembering the time we had with Mimi, Timer, Foster and Tiger who all left us to the rainbow bridge this year. 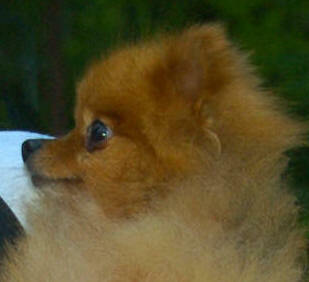 We know that my little angel dogs are now where they need to be, lounging on the ever green grass in heaven. With the special needs cases and the big Chi rescue, our budget is stretched very thin. Our plea for this holiday season is that your open hearts continue to support the work we are doing. 10/18/2013 - The Chihuahuas are doing great. They are adjusting so well to being in a home. You can see more detail on our Available page about each one as they become available for their new homes. 10/06/2013 - our Chihuahuas have arrived. They are doing great considering what they have been through. We will be making the trip to the Vet tomorrow with most for spay/neuters. One is in heat and will wait until that is done and we have two that we believe may be pregnant so will wait a bit to see if they are or not. We also received a sweet momma with little Baby Hope. Those two will be with us for a bit until baby is older. We expect that these dogs will require vetting between $150 and $500 in expenses for each dog depending on the extent of their needs. Their placement fees will not cover our Vet expenses so we are putting out the plea for donations. Please help us save these dogs. See more pictures and detail at this link. 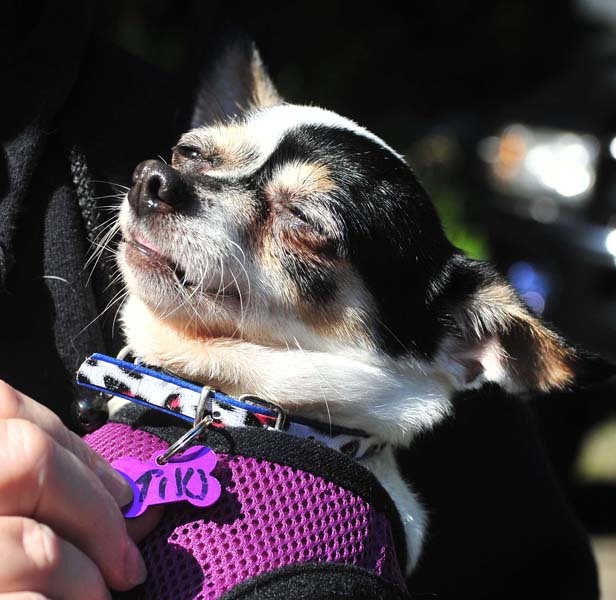 10/04/2013 - Tomorrow is the large surrender of 13 Chihuahuas. Thinking, other than Vet Funds, we are in pretty good shape. From our conversations we know that these dogs are living in a "out building" and that they have not had much handling. We don't know what to expect in behaviors. We do expect that these dogs will require vetting between $150 and $500 in expenses for each dog depending on the extent of their needs. Their placement fees will not cover our Vet expenses so we are putting out the plea for donations. Please help us save these dogs. We are doing great for personnel on Saturday and Sunday, but are still open for a couple of nearby fosters for a few weeks while we work to find appropriate homes. We have our vet schedule for the 7th when he will be spaying/neutering all of them who pass our health screening. These dogs will begin becoming available end of the week. Here are some finished sots from the run work on the 20th. 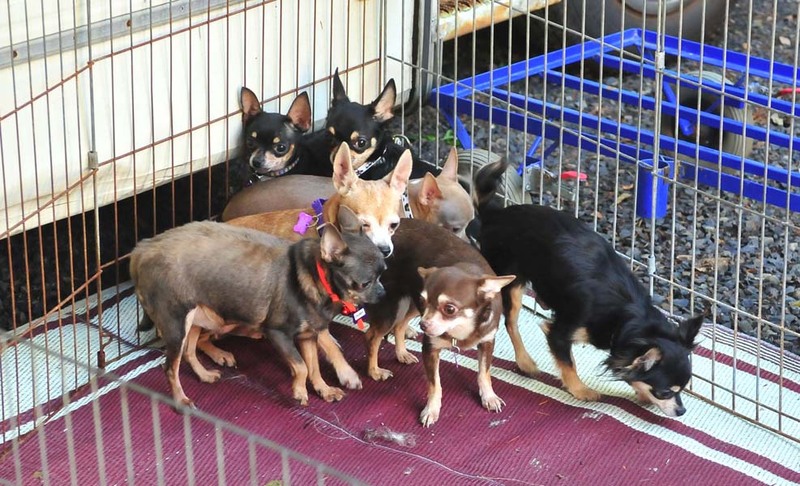 09/24/2013 - We are going to be doing a large surrender of 13 Chihuahuas on Oct. 5th. From our conversations we know that these dogs are living in a "out building" and that they have not had much handling. We don't know what to expect in behaviors. We do expect that these dogs will require vetting between $150 and $500 in expenses for each dog depending on the extent of their needs. Their placement fees will not cover our Vet expenses so we are putting out the plea for donations. Please help us save these dogs. the 6th, for the bathing portion of the rescue. We have our vet schedule for the 7th when he will be spaying/neutering all of them who are healthy enough. These dogs will begin becoming available end of the week. 09/22/2013 - Our PetSmart and Antropologies events were great fun and the dogs got tons of cuddles. Many thanks to the friends and family of Lois Lepschat for the generous donations in her memory. Every penny is being put to very good use. 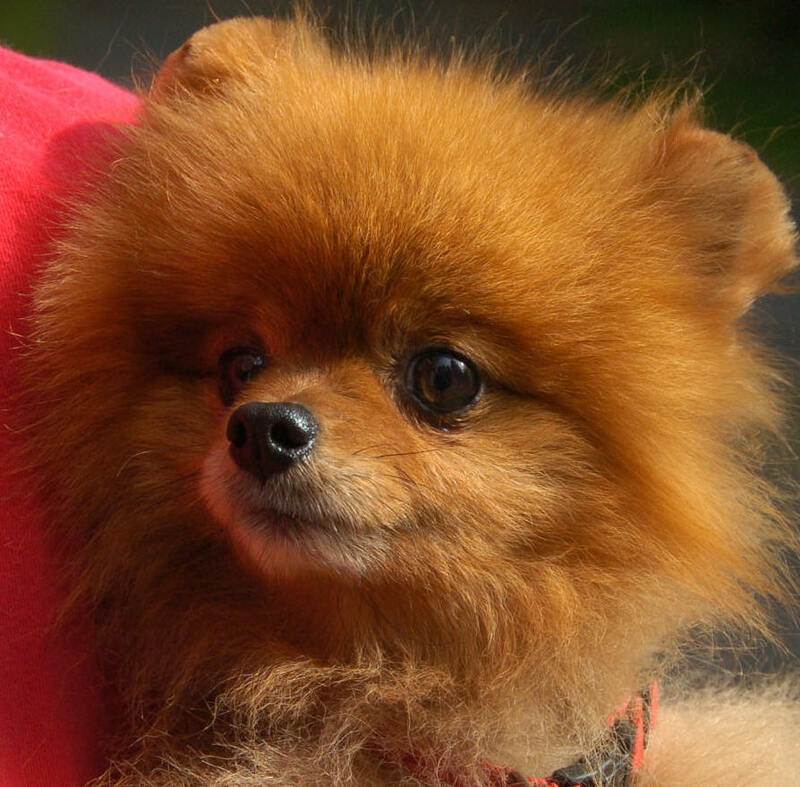 Lois adopted "Calvin" (his name at the time of the rescue) one of the Poms from our 2011 mass surrender. 09/11/2013 - We are so pleased with Hunter's recovery. I can't wait to find his perfect home. He will be participating his first rescue event at PetSmart this weekend. With the special needs cases we have worked through recently, and the seniors that are slow to place, our budget is stretched very thin. We are definitely in need of some additional funds in order to keep up this momentum. If you would like to donate to help these special needs babies you can do that below and specify the dog the funds are intended to benefit. Thanks so much for your caring assistance. Helpers for doggie handlers are way welcome. Install awning flashing, lay patio blocks in runs for mud control, stain and seal deck and awning posts. Anthropologie, Sit, Stay, Love Event at downtown location, 1115 NW Couch Street, Portland. 08/12/2013 - The Awning project went great. I can hardly believe that we got it all up in one day. Just in time for the rain on Saturday. No more wet muddy dogs YAY!!! Thank you so much to all who helped. We are currently hosting a full house of rescues and between our special needs cases and the summer projects are budget is stretched very thin. We are definitely in need of some additional funds to proceed with some vet care for our special needs kids. Hunter needs to have a surgery to remove a mass in his chest. We believe that this is going to run about $1500. Polly needs surgery to repair a hernia and remove a lump, which will be about $300. If you would like to donate to help these special needs babies you can do that below and specify the dog the funds are intended to benefit. Thanks so much for your caring assistance. 08/06/2013 - The results of our P3 Breed Identification Contest are posted. Find out the surprise results. 07/04/2013 - Today we are kicking off our P3 Breed Identification Contest. This will run through the end of July and the prize if 50% of the donations. Click here to find out more details. August 9th - 11 AM to 4 PM - Awning project day. We have several folks coming and welcome more to help install the awning that will completely cover our inside run and deck run. Lunch will be provided. 06/09/2013 - Just a quick update to introduce everyone to our 50th rescue for this year. Kuzco is a super sweet poodle that came to us from Bonnie Hayes. Next goal is 50 placements - we are getting close. 06/04/2013 - Have gotten a great kickoff into summer. See the pictures of our Shrub Project on our Adoption Events page. 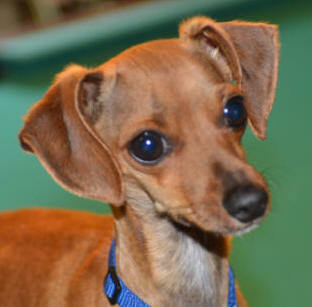 We will be visiting at PetSmart in Hillsboro Saturday June 8 from 11AM to 4PM. Big workday coming up - Mark Your Calendar - Friday, June 21st from 11am to 4pm - The projects are: Fencing completion - will be hanging the last of the chain link fence that is along the road and putting in the top rails. AND - Awning project. Installing three sections of awning. This will give covered deck run and one completely covered yard run. This is very exciting for me - no more wet dogs when it is raining. We are looking for a total of about 8 to 12 people to help out with these. Lunch will be provided. 05/29/2013 - Have some fun stuff coming up over the next few weeks. This weekend - Saturday the 1st, we will be planting 18 bushes that will form a hedge around our runs. This will not only provide additional shade for the fur kids, it will cut down on some of the noise. Pat and I intend to start the digging and planting about 11am. Any additional assistance would be hugely appreciated. 05/07/2013 - WOW didn't we take a leap into summer. I can't believe that it is May already. Currently we have a couple of very special girls in house. Tilly is a super sweet girl who has had some scary changes in her past. She is super shy and now after almost a week we are beginning to see her coming around. Casey is another girl who is going to need some very special care. It appears that she is blind in one eye. She is coming around but it is going slow and easy. Both are looking for very special patient homes. We are delighted to now be a Pet Partner with Pet Smart now as well as Pet Co. Our first PetSmart was a huge success with several placements stemming from applications at that event. We will be at PetCo on TV Highway in Hillsboro on Saturday from 12 to 4. Stop by and visit. 04/15/2013 - I can't believe that Spring is upon us. Things are staying busy around here for sure. We have had some wonderful and touching successes this year already. One was a very special placement for a service dog. 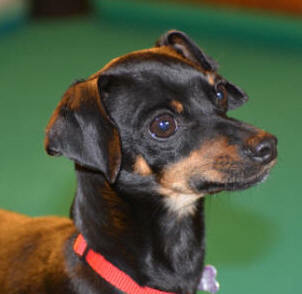 Boogie's story can be found on our Happy Tails page. We are working out the schedule for our awning project, and the completion of our fencing project. I expect that will be scheduled for the first part of June. Specific dates will be posted as soon as they are available. I am also working through some grant applications. If there is anyone out there who has experience in writing grants and submitting them I could definitely use an experienced hand with it. 12/31/2012 - As I sit here on my couch, with my lap full of our little rescues, watching the snow fall and enjoying the fireplace light, I find myself thinking on the past year with a lot of pride. We have accomplished so much in 2012 and are getting excited about our new goals for 2013, which we will be announcing in the next couple of weeks. Taken in 67 rescue dogs from shelters and private surrender. Of those 67 we have placed 54 (12 currently in residence). Helped with 4 critical needs Vet Care assistance - keeping dogs in homes where they would have been surrendered otherwise. Took on two new "Special Needs" - Extended stay dogs. Awning expansion - first level expanded - two more sections to go. Fencing project - main part completed, remaining 100ft will wait for better weather and some muscle assistance. Kicked off our expansion plan. We now have a contractors estimate and are preparing our grant applications. I would like to thank everyone who has helped us along the way this year. We could not have accomplished any of this without your help. 10/30/2012 - We made the tough decision to delay our awning project this year as we just were not finding the labor resources we needed to complete it. Seems that people avoid working in the cold LOL imagine that :) We will put this one back on our list in the Spring. We have our fencing project half done and looking really great and have even done a little curb appeal adding some wonderful shrubs that will give us very pretty flower backgrounds for pictures. The fence will provide that safety net for dogs that might wander to closely to the road. Hopefully we will get the last 100 foot section completed this weekend. We are still looking for a contractor who will work with us to do an estimate for our "Addition Project". We are preparing to apply for some grant funding and need to have some structure around that application. I have the basic plans but am in need someone in the field help me get to the next step. We will be taking these plans and applying for Grants as our next step. 10/10/2012 - With Winter rapidly approaching we are working very hard to complete a couple of projects this month. Here is the work schedule, if you want to drop in an help any and all assistance is greatly appreciated. Call or Email me for directions. We are also still looking for a contractor who will work with us to do an estimate for our "Addition Project". We are preparing to apply for some grant funding and need to have some structure around that application. I have the basic plans but am in need someone in the field help me get to the next step. We will be taking these plans and applying for Grants as our next step. Brief Description of Activity: Drill post holes, and cement set fencing posts. Finish ground leveling. Fencing is intended to protect visiting dogs from highway access. 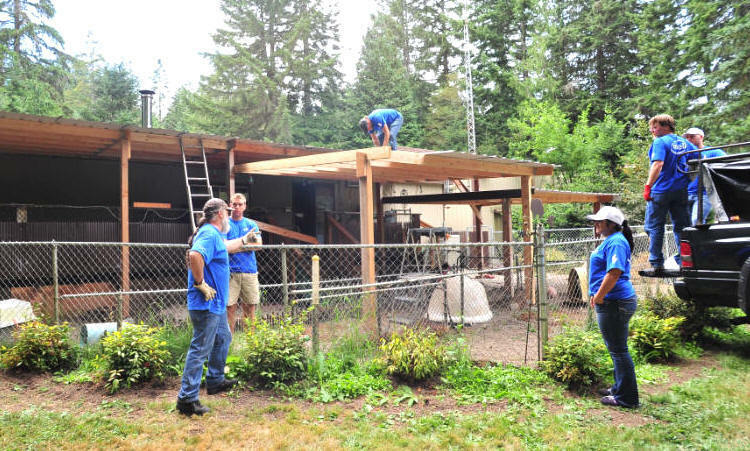 Brief Description of Activity: Install awning covering the dog runs. 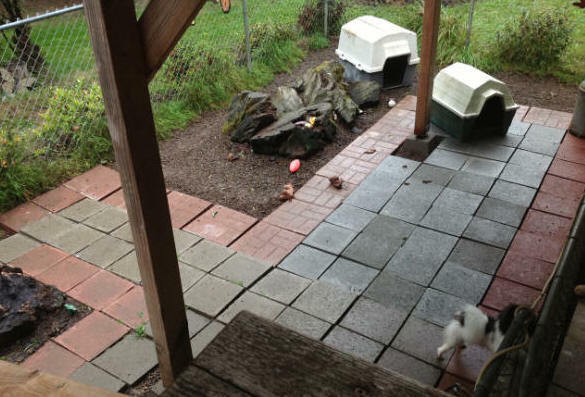 This installation will fully cover two dog areas giving them weather protection for outdoor exercise through the winter. Brief Description of Activity: Stretch and attach chain link fencing fabric, install top rails. Fencing is intended to protect visiting dogs from highway access. 09/16/2012 - Wahoo :) we just announced the addition of Boarding and Grooming services as fund raising efforts. 09/13/2012 - This has been a busy month with several projects in process. We are definitely feeling hints of fall in the air so are feeling pushed to get the first ones completed. We have a fence building job in process. If you would like to come and help us string about 400 feet of chain link we are trying to schedule volunteers. Hopefully we are looking at Wed or Thurs of next week 09/19 or 20. Please email me at Christy@DisplacedPetsRescue.com if you can help. Upcoming project - Awning Extension. We are hoping to complete this before winter hits, but... funds what they are we don't know if we will make it. We need about $600 more to purchase the lumber and metal. This addition will double the "out of weather" space we currently have outside. We are also still working on creating an estimate and budget for our "Addition Project". We are preparing to apply for some grant funding and need to have some structure around that application. I have the basic plans but am in need someone in the field help me get to the next step. We will be taking these plans and applying for Grants as our next step. Amadeus is our feature baby this month. When Amadeus he looks at you with his big intellectual eyes you know he is understanding every word you say. Check out more pictures and details about Amadeus in his listing. 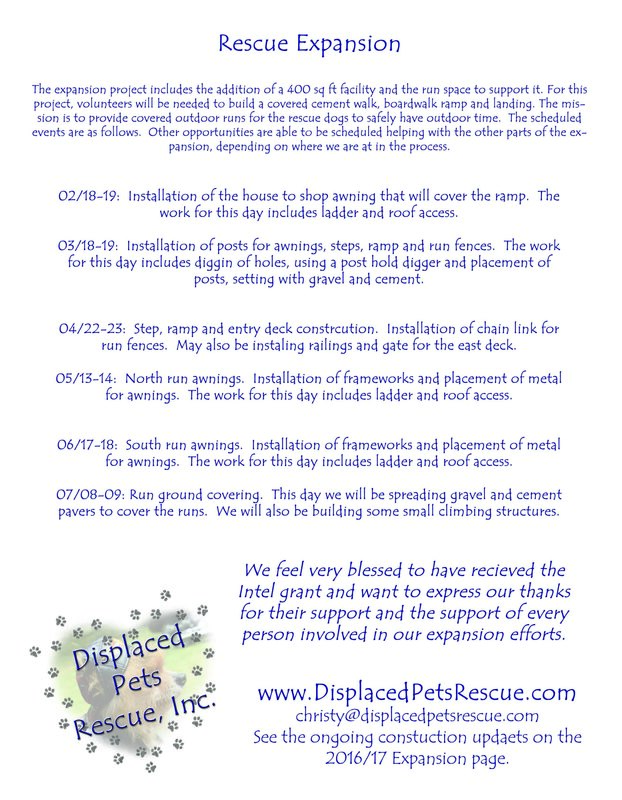 08/02/2012 - We are looking for a contractor who will work with me to create an estimate and budget for constructing an addition for the rescue. We are preparing to apply for some grant funding and need to have some structure around that application. I will be creating some very basic plan (ideas mostly… ) so have a really good idea of what I want, but need someone in the field help me get to the next step. Please email me at Christy@DisplacedPetsRescue.com if you can help. Mozart is our feature baby this month. He is a very pretty little guy who would love to find a home where his fun little personality will be loved and appreciated. Check out more pictures and details about Mozart in his listing. Message from the director - 01/06/2012 - Welcome to the new year. We are very pleased with our placement numbers from last year. 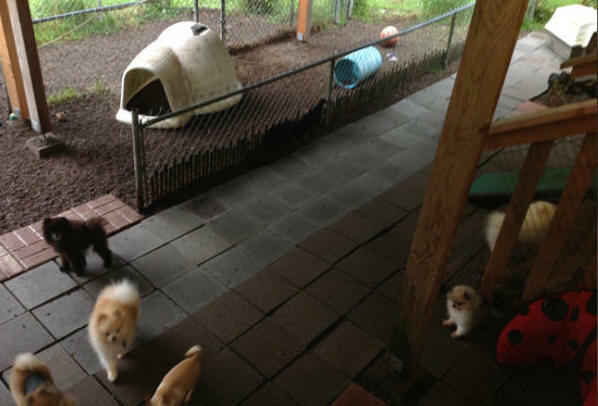 We successfully placed 89 (54 Pomeranians) rescues in great homes, and were able to assist 8 families in being able to keep their pets through some tough circumstances. Additionally 4 of our placements were dogs with significant medical expenses. The mass rescue from August was a huge effort, heart wrenching and rewarding in seeing these wonderful dogs go to great homes. Our activities of 2011, by far, surpassed our goals for the year of 60 placements and 4 assistances. Your donations are what allows us to continue these activities. In today's economical environment that can be very difficult, but it is even more important. We are totally donation funded so these continuing efforts need your assistance. Every single dollar does make a difference. 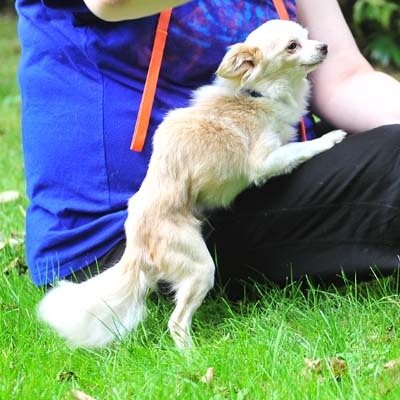 Please see our Mass Surrender for comments, pictures and detail surrounding the rescue of 25 Pomeranians and Chihuahuas. Message from the director - 12/30/2010 - As we close 2010 we are very pleased with the work we have done this year. With 32 placements we feel that we have accomplished quite a lot. For 2011 we want to expand what we are doing and are setting very aggressive goals of 60 placements and 4 family assist projects. Understanding that this is a huge undertaking for such a small organization is very important. It is your donations that are going to help us fund these efforts. Just think 60 dogs that will have new wonderful forever homes in the next year. No donation is to small and every penny counts.